Once the total cost and portion cost of a recipe has been established, it’s time to set prices for the menu. There are a multitude of factors to consider, many of which we’ve discussed in previous chapters. Obviously we have to consider our costs, since we are in business to make money (or at least meet our budget or breakeven in the case of some onsite segments.) We have to consider our customers. What do they consider a good value? We know the restaurant business is not just about the food, but also the service, the experience, the ambiance. Customers are typically willing to pay more for a menu item if there are other “added value” features such as convenience (i.e. food that is delivered), superb service (i.e. fine dining, cooking at the table), ambiance (i.e. rotating restaurant with a view of the city), or a special experience (i.e. dinner with a show or a table in the kitchen.) It’s all about the price/value relationship for each individual customer. Location also affects what customers are willing to pay. Think about the difference in the price of just a bottle of water in a restaurant, a vending machine, or a sporting venue! Prices in the airport are usually higher even for the exact same food from a chain restaurant. Prices usually vary, even for the same menu item, during different meal periods with lunch typically less expensive than dinner. Portions sizes, product quality, and the menu mix are also factors to consider. We will further explore some of these issues in the discussion about menu analysis. Think about how all of these factors affect the setting of menu prices. Many onsite segments of the industry also have to price a part or all of their menu offerings, with various considerations. K-12 typically sets a meal price at the beginning of the school year and sticks with it all year. Colleges and universities may offer “all you can eat” dining options and set the price at least for a full semester, if not the entire academic year. Hospitals set menu prices for their employee and visitor cafeterias, but may try to keep prices low as a sort of employee benefit. Business and industry also may offer menus at very reasonable, below market value, prices to encourage employees to eat on site. Remember that each foodservice operation will be a bit different, so management will have to research and be aware of all the various pricing considerations that apply to that specific operation and the local environment. Although you likely have a target overall food cost in your establishment, not every menu item will carry exactly the same food cost percentage. Some items are more costly than others, but most establishments will have a range of prices that all the menu items fit into. Consequently, it is important to balance the menu so that the low and high food cost items work together to help you reach your target food cost. This process is called “blended pricing” and results from using menu engineering or menu analysis. Menu engineering means balancing the high and low food cost items; it also includes strategically featuring or promoting items to help reach your targets. The cost per portion derived from yield tests done on the main ingredient of a menu item usually represents the greatest part of the cost of preparing the item (see the section above on yield tests for more information). However, of equal importance is the portion cost factor. For example, the portion cost factor can be used to determine the cost of a portion of the main ingredient regardless of the price of the meat (which is often the main cost factor) charged by the supplier as long as the restaurant’s preparation of the meat remains unchanged. The cost per portion is determined by multiplying the portion cost factor by the packing house’s price per kilogram (or pound). Quite often the cost per portion of the main ingredient is used by itself to determine the selling price of a menu item. This works well with items on an à la carte menu as the basic main ingredient (such as a steak) is sold by itself and traditional add-ons (such as a baked potato and other vegetables) are sold separately. As discussed earlier in this book, in many cases, some of the components will be the same, so a basic plate cost can be used to add to the cost of the main protein to get a total cost for the dish. Once the potential cost of a menu item is determined, the selling price of the item can also be calculated by using the food cost percentage. Another way of expressing the food cost is as a cost mark-up. The restaurant would charge at least $3.78 for the menu item if it wants to keep its mark-up margin at 3.6, which is about a 28% food cost percentage. This price might be adjusted because of competition selling the same item for a different price, price rounding policies of the restaurant or the whims of management. For example, many restaurants have prices that end in 5 or 9 (such as $4.99 or $5.95). Prices on such menus tend to be rounded to the nearest number ending in 5 or 9. No matter what the final menu price is, at least a base price has been established. The problem with the above approach is it doesn’t explain how to select a food percentage or a selling price from which to derive the percentage. In many cases, the food percentage is based on past experiences of the manager, or by a supposed awareness of industry averages. For example, many people simply set their food percentage at 30% and never work out a more appropriate figure. Similarly, the selling price of a menu item is often the product of guessing what the market will bear: $4.50 for a bowl of soup may seem like a good deal or as much as a reasonable person might pay in that restaurant. Unfortunately, none of these methods takes into account the unique situations affecting most restaurants. 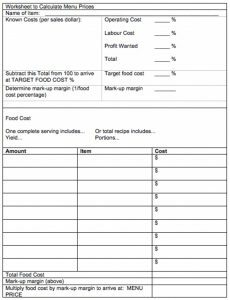 A more accurate way of computing a target food cost percentage is to estimate total sales, labor costs, and hoped-for profits. These figures are used to determine allowed food costs. The total of projected food costs is divided by the projected sales to produce a food cost percentage. The food cost percentage can be turned into a mark-up margin by dividing the percentage into 1, as shown above. In this example, the menu prices would be determined by multiplying the portion costs of each item by the mark-up margin of 4. Adjustments would then be made to better fit the prices to local market conditions. If the application of the derived mark-up margin produces unreasonable prices, then one or more of the projected sales, labor costs, overhead, or profits are probably unreasonable. The advantage of using this system is that it points out (but does not pinpoint) such problem assumptions early in the process. A similar approach uses a worksheet as shown in Figure 1. In the middle section of the worksheet in Figure 1, a food cost percentage is determined by subtracting other known cost percentages from 100%. Food costs are then determined in the bottom half of the sheet and a menu price derived by multiplying the total cost by the mark-up margin. In this pricing method, a “profit wanted” percentage is added to the cost of each menu item. This builds some potential profit into the menu prices. If you were to price everything according to costs only, the restaurant would only ever be able to break even and never turn a profit. On the surface, it seems that the lower the food cost, the more room there is for profit. In one sense this is true, as the percentage profit is obviously greater for an item that has a food cost percentage of 25% (or 75% percentage profit) than an item that has a food percentage cost of 45% (or 55% percentage profit). However, in terms of monetary profit, the issue is not that straightforward. What has to be determined is how much money the menu item generates. This calculation involves finding the contribution margin of each item. Consider the contribution margin of two menu items that have different food costs and food cost percentages shown in Figure 2. A table compares 2 items, chicken and steak. Columns are Item, Food Cost, Selling Price, Food Cost Percentage and Contribution Margin. In terms of percentage profit, the chicken is higher. However, in terms of money in the till, the steak creates more money that can be used to pay bills. The key to a good menu is not necessarily to just keep food cost percentages low; it is to also to keep contribution margins high. Menu offerings such as buffets and salad bars offer a different challenge when it comes to pricing. Actually the pricing can be done using the calculations described previously. The challenge is calculating the unit cost or “plate cost” which has to be established prior to setting a price. The simple formula for “plate cost” is dividing the total food cost by the number of customers served. Calculating the total food cost requires keeping track of what is used on the buffet or salad bar on an average day or meal period. To do this track product usage by recording the number of servings at the beginning of the serving period, adding any additional servings as needed during the service time, and then subtract the number of portions left at the end of the serving period. Multiply the total number of servings (portions) used by the cost per serving for a total food cost for each offering on the buffet or salad bar. Then calculate the total dollar amount of product used and divide by the number of customers served. See sample chart below. A table displays menu items in the left column. Other columns include, from left to right: Number of portions at start, Number of portions added, Number of portions at close, Total portions used, Recipe cost per portion and Total product cost. Various pricing strategies are also used to drive business in a foodservice operation. These include things like bundling (combo meals), value pricing and couponing, all of which are probably familiar concepts to most. These pricing approaches strive to either increase the number of customers patronizing the operation or increase the average check or the amount each customer spends. The end goal – increase revenue! Bundling is combining a group of menu items, typically an entrée, side and beverage, and selling the items together for one price, sometimes called a combo meal. The combined price is typically a bit cheaper than if the menu items were purchased separately, but the “bundle” price often increases the average check for each customer, thus bringing in more revenue overall for the operation. The availability of combo meals could also positively influence a customer’s decision to visit a foodservice operation. An example of value pricing is the $1(or $2) menu. These are items that will contribute a reduced contribution margin to the foodservice business and are sometimes called “loss leaders.” The idea is that the price of a few popular menu items is reduced to encourage customers to visit the operation for these great values thus increasing the total number of customers for the operation. Happy hour at many bars and restaurants often has some sort of value pricing on a few beverage options. The intended result is more customers which leads to more revenue. The hope with the value pricing of menu and beverage items is that customers will also purchase other menu items with a higher contribution margin and increase profits overall. Can you think of some examples of different types of coupons used by restaurants and other foodservice operations? How about “buy one, get one free (or second item half price), or 20% off an entrée between the hours of 4pm to 5pm or on Monday evenings (typically slower times for restaurants.) Coupons may be paper or electronic. This pricing strategy allows a foodservice operation to target the general public, perhaps in an attempt to gain new customers, or reward a specific customer, perhaps those who are part of a loyalty program or celebrating a special occasion, such as a birthday. Either way the overall goal of couponing is typically to increase the number of customers, thus increasing overall revenue. Foodservice managers responsible for pricing menu items will find that they need to draw on not only the math of recipe costing and pricing factors, but also the psychology behind designing the actual physical menu, which is a major marketing tool in this business. Understanding the target customers’ needs and wants along with the price/value relationship for those customers is a significant responsibility for whomever makes the final decision on menu prices for a foodservice operation. What factors should be considered in addition to costs when setting menu prices? Why are using a mark-up factor and using a food cost percentage to set a minimum selling price basically the same? What are some situations where using couponing, bundling and value pricing could be “good practices” for a restaurant? Why is it important to consider the price value relationship when setting menu prices? Why is it important to consider both food cost percentages and contribution margins when deciding on a menu mix? How do these two types of data analysis relate to blended pricing? How are calculating a plate cost and pricing a salad bar or buffet related? Author, The BC Cook Articulation Committee, Sep 2015. The Principles of Menu Engineering. In Pressbooks Edition 1.0. Basic Kitchen and Food Service Management.